Best Slow Feeder Dog Bowl – Could your Dog Benefit Using One? Raw Food for Dogs – Is it Good or Not? Best Diet Food for Dogs | Do You Need to Put Your Dog on a Diet? Can Dogs Eat Human Food? Are You Feeding Your Dog Too Much? What is Reverse Sneezing in Dogs? Trimming Black Dog Nails the Safe Way. Easy Once You Know the Trick. Can You Use Shampoo on Dogs? What Can I Use to Wash My Dog? ✅ In a hurry? Here is the best combination of dog harness and dog headrest seat belt to keep your dog SAFE in the car. This is the link to get the dog harness, Click Here (make sure you measure your dog for size). Here is the best dog seat belt (see the reasons below for why this is the best), Click Here (and choose a color that suits your dog’s personality). It used to be difficult to find a dog car seat belt, but now there are almost too many to choose from. When it comes to dog seat belts my first concern is always safety and then comfort as a close second. ⭐ Why do I need to buy a dog seat belt? If you’ve ever known anyone that’s been in a fender bender with a dog in the car, they’ll tell you it is a disaster for your dog if they’re not restrained. If your car stops suddenly your dog will get thrown violently across the car either into a window or down into the foot-well. This can result in serious injuries or death to your beloved pet. Spend just a few dollars to ensure the safety of your dog and you’ll be happy you did. No one wants to see their pet go through lengthy surgery to fix broken bones or worse. Dog car restraints are not expensive but they can save you and your dog from a terrible outcome should the worst happen and your car is in an accident. Get the best dog seat belt for your dog and you could even save his life. In addition to the risk to your dog, there is a risk of your dog injuring one of the people in the car. A 70-pound Labrador being hurled across a car and into a person can be extremely dangerous for everyone involved. Apart from the risk of being in a car accident there is also the safety aspect that you don’t want your dog bouncing around the car while you’re driving. I remember when I was a lot younger and I was a new driver. I put my dog in the car to go on a 10 minute drive and it was a nightmare because my dog wasn’t restrained. He jumped from the back seat through to the front while I was driving and then proceeded to try and lick my face. It was ridiculous how unsafe this was. I learned a valuable lesson from this one short drive. ⭐ What components do I need for dog car safety? There are several components to consider to restrain your dog safely. You’ll need a harness for your dog to attach the dog seat belt. A special seat belt or dog car leash is the next requirement. Next you should consider whether you want a dog booster seat or car seat for your dog. If you want a dog seat for the car, then you need to get one where you can still attach the best dog seat belt that suits your dog to make sure he’s safe. The dog seat is usually about comfort rather than safety. However, for many smaller dogs a booster seat helps them feel better in the car and avoids travel sickness because they can see out the window. And this is especially important if you’re going on a longer trip. If you just want the basics, then you need to find the best dog seat belt along with a good harness that suits the size and shape of your dog. Since this is a safety issue, it’s important that you get the correct fitting on your dog’s harness. ⭐ What is the best dog seat belt? We’re going to look at two different types of dog restraint. The first is the type where one end clips on to your dog’s harness and the other end plugs into the seat belt in your car. The second type is where you attach one end to your dog’s harness but the other end is installed around the headrest in the car. There are advantages and disadvantages to both. Which one is the best dog seat belt? First, we’ll look at the dog seat belt clip leash. This is the one that plugs into your car seat belt. We will look at the pros and cons and then move on the the details of the second type of canine seat belt. These are good for dogs that don’t prance around the back seat while you’re driving. If your dog sits still in the car or stands in one place while you’re driving then this is a good seat belt for your dog. They are convenient because there is nothing to install in the car itself. You simply clip one end to your dog’s harness and plug the other end into the car seat clip. You don’t need to leave anything in the car after you’ve taken your dog for a drive. Being simple to use, you can take it with you to use in a friend’s car. There is no time required to install anything. You can take it with you anywhere. This is an important safety consideration. If you’re taking your dog in someone else’s car it is better to have some sort of dog restraint rather than nothing at all. For this reason it is wise to have one of these dog seat belt clip leashes with you. The disadvantages… this may not be the best dog seat belt for your dog if he stands up and moves around a lot on the car seat. Many larger dogs tend to easily stand on the seat belt clip and disengage the dog seat belt. If it dislodges while driving this is dangerous. Not only do you need to pull over to fix the problem but your dog is dragging around a leash with a metal end on it. A lot of larger size dogs, like German Shepherds or Labradors, can easily stand on the seat belt to un-clip it. But, realistically, any size of dog is capable of doing it, so you need to be aware of this. For smaller dogs, although they are less likely to push the seat belt clip hard enough to dislodge it, there is another risk. If your small dog is standing while your drive and then sits down suddenly on the seat belt clip then they can hurt themselves. Because the dog seat belt clip goes directly into the car seat belt, your dog is forced to always be closer to it. This is why he’s more likely to sit on it after he’s been standing. For all the available colors, Click Here. This next type of seat belt for dogs is anchored to the headrest of your car, rather than the seat. This is the best dog seat belt for dogs who tend to un-clip the other type. This restraint is placed around the headrest and can be left in place for each time you take your dog with you. Alternatively, you can easily remove it when getting your dog out of the vehicle. The advantage of this headrest-attached dog seat belt is that it is highly unlikely that your dog will remove it. In fact, I’ve never known or heard of a dog being able to remove this seat belt from the headrest. Of course, now that I’ve written that, I’m sure there will be someone somewhere who tells me they have a very clever dog who is capable of getting it off! But until anyone tells me, I’m pretty sure you’ll be safe with this type of dog seat belt. And because the seat belt is higher up, attached to the headrest, your dog won’t sit on it and hurt himself. He can easily avoid the clip on the seat of the car if he wants to sit down. Another advantage is that a lot of dog parents find it easier to clip the headrest restraint on to their dog’s harness without needing to lean into the car. This can save your back. This type of seat belt is a little bit more time-consuming to install into your car. It doesn’t take too long but it is definitely longer than just clipping a leash into a car seat belt like the other type. Of course, if you’re going to leave it in the car you only need to place it once. With any dog restraint in a car you need to be careful about adjusting the length of it. You’ll need to be more careful about the length of this headrest-attached dog seat belt than the other one. 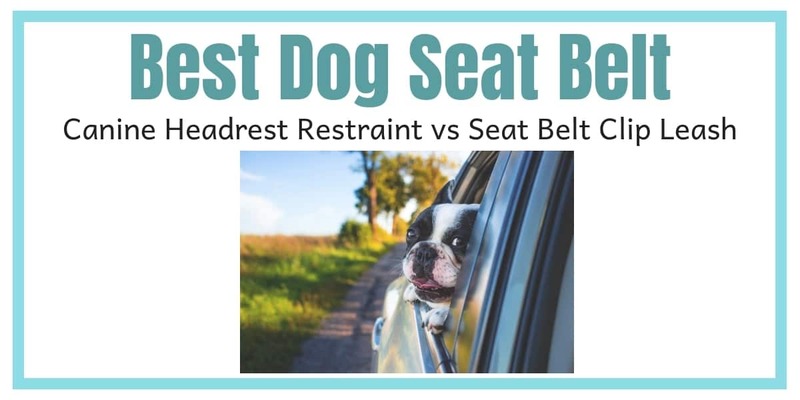 Because you attach the belt at a higher point (the headrest) you need to make sure that there isn’t enough length on it that your dog could lose his footing and go over the edge of the car seat. If it is long enough for this to happen then you need to ensure your dog’s feet can touch the floor of the foot-well if he falls into it. The reason for this is obvious, you don’t want your dog hanging over the edge of the seat without being about to save himself. Usually you’d make sure the headrest-attached seat belt is kept short enough to keep your dog on the seat. ⭐ What is the best dog seat belt for your dog? One of the most important components of a safe dog seat belt, is having a correctly fitted harness on your dog. Here is a good harness to use on your dog for travelling in the car, (click here). And you can use it for going on walks too. There is a measurement chart for determining what size harness your dog needs. Use this. This dog harness comes with a dog seat belt of the clip in variety. While this is great for using as a backup I would buy a second product to go with this harness. This headrest seat belt for dogs can attach to your dog’s harness (click here for details) and the combination is safer for your dog because he is less likely to get the canine seat belt off the headrest, even if he’s bouncing around on the back seat. This seat belt comes in a two pack so you’ve got one for each of your dogs (assuming you have two dogs!). Alternatively, you can place one in your spouse’s car, your kid’s car, give it to a friend or keep it as a spare in case you lose your other one. Another advantage of this dog seat belt is that you can use it as a normal leash. Either in it’s own right, or after getting your dog out of the car. To see all the colors available, click here. If you combine the correct size harness with a headrest dog restraint you’ll find the best dog seat belt that is not only safe for your dog but also comfortable. You’ll love it when you own the proper dog restraint for the car. You get peace of mind and your dog stays safe. If you have a new puppy you need to order a canine seat belt straight away so you’re ready. And if you already have an adult dog, get your seat belt and harness before your next trip in the car. You really don’t want to take the risk and travel without a life-saving seat belt for your dog. ⇒ Need a dog ramp to load your dog into the car? See more here. ⇒ Already have the best dog seat belt but…looking for a car dog bed? Try these. ⇒ Need a dog stroller? Here are the best. This entry was posted in Accessories on August 19, 2018 by Didi. I am genuinely grateful to the owner of this web page who has shared this fantastic article at here. We are a participant in the Amazon Services LLC Associates Program, an affiliate advertising program designed to provide a means for us to earn fees by linking to Amazon.com and affiliated sites. This does not cost you, the buyer, anything extra at all. In the spirit of full disclosure some of the links on this website may be affiliate links, which means I may receive commission if you buy through the link. It will not cost you anything extra. However, please be assured, I will never recommend any product that I don’t believe is high quality or wouldn’t be of benefit to you.